Sticker activity bliss with the cute collectibles. Leaping into trolleys across the globe! 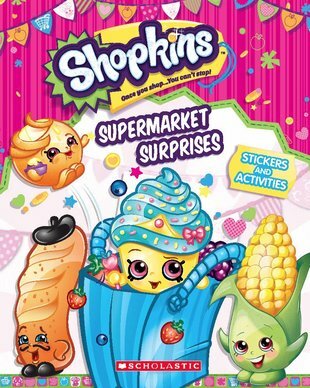 What can you do with Shopkins, apart from collect them? (So gorgeous!) Let them surprise you in this book. It’s full of activity fun with your must-buy buddies, from Rockin’ Broc to Polly Polish. Stickers. Puzzles. Mazes. Parties in the aisles. Hide and seek games. Colouring fun. You’ll especially love the massive full-page scenes of the Small Mart shelves. Cooler than the freezer section!